Never thought I would be writing about dirt, or as the professionals call it, soil. Sub surface soil analysis is standard operating procedure as part of the ready to build process. The analysis requires drilling holes in the ground and having a professional geologist study the core samples of dirt the driller provides. When we built our home two years ago it was determined that we had 1.5 feet of surface muck that needed to be scooped out and replaced with a sandy loam that would compact and bear the load of the house. The load of the house is basically how much the house weighs then broken down to a per square foot weight. A structural professional engineer computes the weight of the house, reviews the core soil sample report, and designs a foundation that will bear the load. Most buyers don’t hire the driller prior to making an offer. We go to srcpa.org and do online soil analysis. I call Joe Bailey of Bailey Engineering and have a discussion about the subsurface before drilling. Joe is an old guy like me and knows the subsurface like I know the water surfaces of North West Florida. As an example, look at the screen shots from one of my properties, Santa Rosa County Property Appraiser’s website (srcpa.org). It shows Lakeland sand as the predominate soil on the Richard Lane property, which means it drains quickly and compacts well for a simple low cost foundation. Soils are only one of many layers you can add to srcpa.org maps. Find the subject property by searching by owner name or address. Then click on the “show parcel map” tab just above the legal descriptions. Let the map load and look on the left column of the page for layer options. Click on the layers you are interested in and refresh the page. Step two of Ready to Build complete. Now you have the information to have an educated discussion with the geologist and structural engineer about designing your dream home. 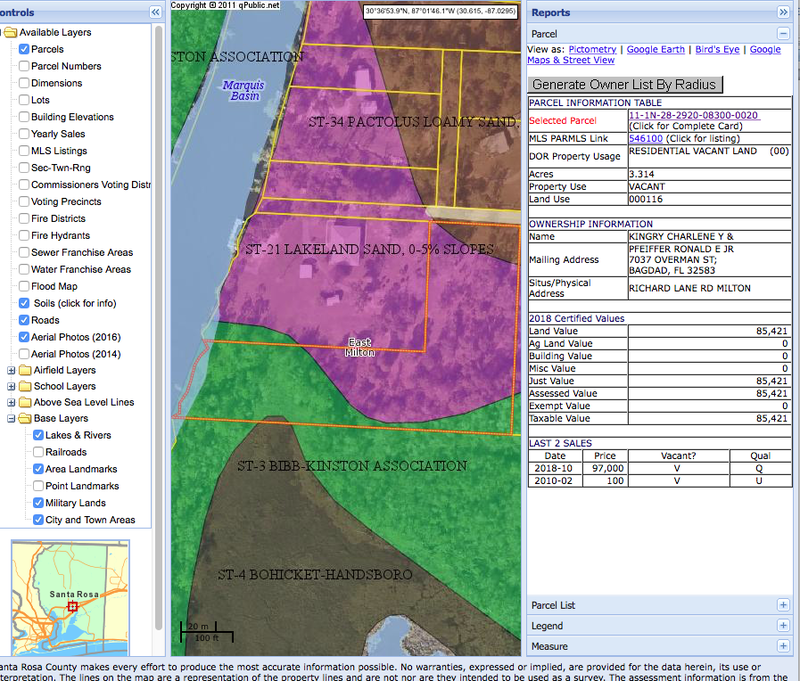 Next blog I will write about flood zone and wetland considerations as we work towards Ready To Build.